Avatex has introduced a new Hayes compatible modem that can be easily connected to the Atari ST. The new Pocket Modem is billed as the most reliable portable modem on the market, and it fits into your shirt pocket. At only 4.75&inch; by 2.5&inch; by 1&inch;, the pocket modem has its own rechargeable battery, a power switch, modular phone line connector and a two-year warranty. 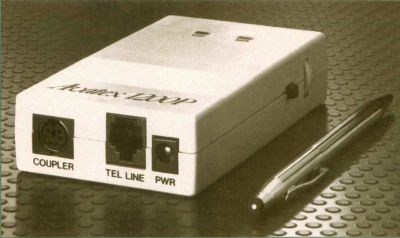 The pocket modem auto-dials and can transmit at 300 or 1200 baud. A dial buffer is included that stores up to 40 characters. Pulse or touch-tone dialing is also supported. The list price is only $149.00, and the modem comes with an IBM-PC communications software program that runs using PC-Ditto. CIRCLE #106 ON READER SERVICE CARD. THE NEW POCKET MODEM IS BILLED AS THE MOST RELIABLE PORTABLE MODEM ON THE MARKET, AND IT FITS INTO YOUR SHIRT POCKET.